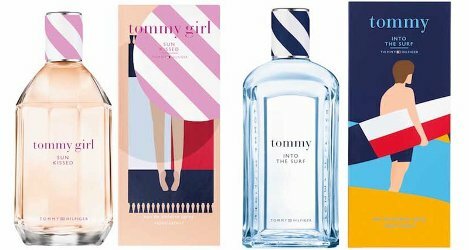 Tommy Hilfiger has launched Tommy Into The Surf and Tommy Girl Sun Kissed, new limited edition flankers for the brand's Tommy and Tommy Girl fragrances. Tommy Into The Surf ~ "Tommy Hilfiger men's fragrance. Capturing the spirit of summer adventure in a new woody, spicy scent. Featuring top notes of cardamom, galangal, and bitter orange, middle notes of ginger, violet, white pepper and clary sage, and base notes of ebony wood and vetiver." Tommy Girl Sun Kissed ~ "Tommy Hilfiger women's fragrance. Capturing the spirit of summer adventure in a new floral, fruity scent. Featuring juicy top notes of cranberry, pixie tangerine and crisp red apple, sweet middle notes of magnolia, beach gardenia and blue violet, and base notes of birchwood, rum and peach cobbler." Tommy Hilfiger Tommy Into The Surf and Tommy Girl Sun Kissed are available in 100 ml Eau de Toilette.